Includes the definition of bullying and harassment in the workplace, outlines workplaces’ legal obligations, and provides information on how to identify, address, and prevent bullying and harassment. (Provided by WorkSafe BC). Resources and templates provided by WorkSafe BC to help employers and employees identify, address, and prevent bullying and harassment in the workplace. Resources include policy statement templates, FAQs, posters, and fact sheets. A series of videos with discussion guides to provide caregivers with information on caring for individuals with dementia, including a brief description of dementia, situations caregivers may encounter, and how to stay safe while supporting individuals with dementia. Developed by WorkSafeBC and the Alzheimer Society of BC. This video outlines a scenario where a health care worker is rebuked while trying to provide care to a resident. It highlights how to address the situation, assess whether or not adding another worker will help, and how approaching a second time may look. Me-and-U First! is a series of eight online learning modules that provide caregivers with the tools to provide better, safer care to individuals with dementia. Modules focus understanding dementia; how communication strategies can be used to improve care; and identifying, addressing, and preventing responsive behaviours among individuals with dementia. A guide for care workers on behaviors related to dementia. Teepa Snow is a dementia-care education specialist with a background in occupational therapy and over 30 years in clinical practice. This was a presentation held by WorkSafe BC on April 27, 2012 on approach and communication with someone who has Dementia. Identifying potential hazards and risks is important in reducing workplace injury. Can you find the hazards in these staged photos? Download the full images and answer key, and share at team meetings, or post at your workplace and encourage staff to find the hazards. There are photos for long-term care and home care and community health support. This document is intended for use by managers, supervisors, workers and joint health and safety committee members. It outlines the steps in a risk assessment and provides details on completing a job hazard analysis. WorkSafeBC is a public agency that promotes and enforces workplace health and safety in the province of BC. WorkSafeBC provides injured workers with compensation, medical benefits, and help returning to work safely after their injury. CCOHS is a not-for-profit federal department corporation offering work-related injury and illness prevention initiatives and occupational health and safety information. CCOHS provides Canadians with unbiased, relevant information and advice that supports responsible decision-making and promotes safe and healthy working environments. The Association of Workers’ Compensation Boards of Canada (AWCBC) is a non-profit organization, established to facilitate the exchange of information between Workers’ Compensation Boards and Commissions. The Workers Compensation Act defines the responsibilities, obligations, and duties of government agencies, workers, employers, and other organizations as related to workplace safety in British Columbia. Gordon Macatee’s WorksafeBC Review and Action Plan status report that includes 43 recommendations. Injury trends profile by organization size. B.C.’s long term care sector has one of the highest injury rates compared to all industries in the province. See the sector injury trends at a glance. B.C.’s home and community care sector have an injury rate that is twice the average of all industries in the province. See the sector injury trends at a glance. Industry trends profile by organization size. This presentation covers the 2016 Injury trends and preliminary assessment rates (2018) for long-term care and home and community care. A humorous video to remind us why appropriate infectious agent control measures are important. This handbook describes common infectious diseases and how they are spread, explains how to protect workers from exposure, and explains the requirements of the Regulation that relate to infectious diseases. Developed by WorkSafeBC. How Effective Are Your Infection Control Practices? To help prevent instances of healthcare-associated infections, the Center for Disease Control has created a new tool for assessing infection control programs and practices in nursing homes and other long-term care facilities. If you don’t have a self-assessment tool for infection control, here is a resource developed by the Center for Disease Control for you to use. These resources have been developed and approved by SafeCare BC’s Technical Advisory Committee, which is comprised of union, WorkSafeBC, and employer representatives. The general health and safety orientation provides general information related to the organization’s overall occupational health and safety program. This template provides home care and community health support supervisors with an overview of Occupational Health and Safety topics to be considered for inclusion when providing caregiver-specific health and safety training and should be used with the general health and safety orientation. This template will help your organization create or refine a Violence Prevention Policy. This template will help your organization create or refine a Safe Client Handling Policy. This handbook outlines the legal responsibilities of supervisors in a health care setting, common duties supervisors may perform to fulfill these duties, and tools and resources to help supervisors in their roles. This guide can help supervisors learn about their legal obligations related to occupational health and safety. The guide can be downloaded and customized to match employers needs. These videos help supervisors learn what they need to do to ensure the safety of their staff. Answers from a panelist of industry professionals that occurred via teleforum on May 8, 2017 related to WorkSafeBC ‘s recent regulatory changes to Joint Occupational Health and Safety Committee requirements. A summary of the changes that took place on April 3, 2017 relating to the Joint Health and Safety Committee Regulations. Overview on the Joint Health and Safety Committee, including when you need a committee, what the committee can do and what the requirements for training are. Common frequently asked questions regarding Joint Health and Safety Committees. Common frequently asked questions regarding the role of worker health and safety representatives. New resources for joint committees and worker health and safety representatives that contains all of the information that you will need to comply with the changes. Psychological Health and Safety Standard (CSA-Z1003-13) The Standard is a document that outlines a systematic approach to develop and sustain a psychologically healthy and safe workplace. It focuses on mental illness prevention and mental health promotion. Sample Audit Tool A gap analysis tool that provides you with a baseline measurement of current status of psychological health and safety in your workplace. Psychological Health and Safety Standard FAQ This document reflects general answers to some frequently asked questions by Canadian organizations around the four phased approach to implement the Standard. 13 Factors: Addressing Mental Health in the Workplace Created in partnership with Ottawa Public Health, with adapted content from the Mindful Employer, this series of short animated videos aims to raise awareness around the evidence-embedded 13 factors that can impact the mental health of employees in the workplace and encourage conversations on ways to promote psychologically healthy and safe workplaces. This Safe Client Handling Policy Template was developed and approved by SafeCare BC’s Technical Advisory Committee, which is comprised of union, WorkSafeBC, and employer representatives. A Safe Resident Handling Policy Template developed and approved by SafeCare BC’s Technical Advisory Committee, which is comprised of union, WorkSafeBC, and employer representatives. A guide and supplementary poster on point of care assessments for safer resident and client transfers. Before transferring or re-positioning a patient, a health care worker should perform a point-of-care risk assessment to confirm that the existing method identified for transferring or repositioning is still safe. This bulletin provides a broad overview on what factors to consider. Effective March 1st 2017, the BC Emergency Health Services (BCEHS) will no longer respond to requests from licensed long term care facilities for lift assist support where no emergency medical care is required. This does not apply to Assisted Living Facilities. A violence risk assessment is a process used to determine the risk of violence present in a workplace and provides information on what actions should be taken to eliminate or minimize the level of risk for care workers. A Violence Prevention Policy Template developed and approved by SafeCare BC’s Technical Advisory Committee, which is comprised of Union, WorkSafeBC, and Employer Representatives. A handbook that explores different care approaches and interventions that can be used to reduce the risk of violence to the health care worker when caring for an individual with dementia. An in-depth study into the problems of aggression within five of British Columbia’s long-term care facilities. The study’s findings recommend that employers use a systems approach to develop prevention and risk management strategies to reduce incidence of aggression in the workplace. A guide developed by WorkSafeBC to help health care workers balance their obligations to protect client privacy with the need to communicate information to reduce the risk of acts of violence or aggression towards health care workers. This guide is suitable for those working for non-public bodies, including most affiliate and private long term care facilities. This information is targeted to administrators, front-line supervisors, members of joint occupational health and safety committees, educators, and risk managers. Online educational modules designed to address different forms of violence health care workers may encounter in their workplaces. Modules outline tools to identify, prevent, and / or address potentially violent situations, and how health care workers and employers can work together to create safer workplaces. Links provided to the provincially-developed Violence Prevention curriculum workbooks. These workbooks include information, tools, and self-study quizzes. A PDF that provides Injury Prevention Resources on Violence in Healthcare, Dementia, Home Care, Patient Handling, Infectious Disease, Supervision in Health Care, Falls. 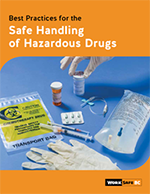 Mainly intended for the health care industry, this book provides an overview of current knowledge on hazardous drugs, describes how to perform a risk assessment and gives examples of best practices for each stage of handling hazardous drugs.